It looks like we overstayed our welcome. Apparently I “miscounted” the 30 days from our initial entry into Thailand. 30 days is the length of time one can be in Thailand without needing a visa. It seems like it would be an easy thing to count – you know, to thirty. I must have skipped the first day or something. The good news is that we didn’t go to jail and they let us leave the country. 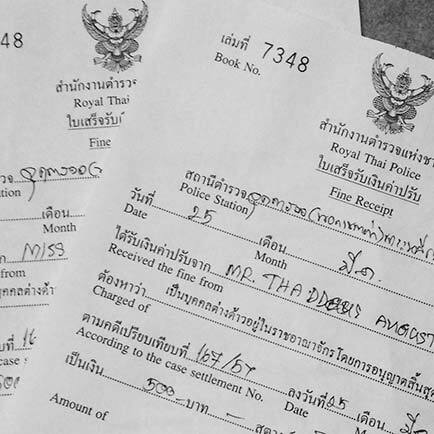 Also, we got these really cool receipts from the Royal Thai Police. The bad news is that we had to pay 500 Baht each for the “extra” day. Actually, that’s probably good news, too, since that’s only about $15 USD per person. It’s a good chunk of our daily budget, but not a huge deal in the long run. Actually, kinda sounds like a Bargain!! Whats a trip around the world without getting in trouble every now and then! Enjoying your posts. Thailand has gone soft. I would have at least given you 30 lashes and made you count them all. It’s good to know that you’ve already forgotten what day it is.